I did wonder how long it would take me to start missing Mull and begin searching the property listings once more but even by my standards the afternoon of our return was unexpectedly rapid. The fact is that we had such a fantastic time that initially at least all I could focus on was how soon until we could get back? October’s looking like a potential option and is an attractive time of year too with the island’s Red Deer rut in full swing and all that choking Bracken well and truly dead. Good for walking and photography alike. The long drive home also got us talking about a new project we’d like to take on which should make our future exploration, in particular a tour of the entire Hebrides archipelago, a much easier and more enjoyable affair. For now though that’s all I’m going to say on the subject just in case nothing more comes of it. In the meantime the best way to take our minds off that Mull shaped hole in our hearts was to get back out into the great outdoors which is exactly what we’ve been doing. First up was a late evening visit to the old Pembrey harbour a couple of weeks ago in order to coincide with both a spring high tide and sunset. Our timing was a little off arriving as we did after the main sandbanks had been inundated but that only made the views across the Burry Inlet all the more impressive. The less said about the sunset the better (it went cloudy). Even as we watched the water level continued to rise, moving with a surprising turn of pace as it crept first up to the edge of its normal containment before spilling over. Footprints left from the day’s visitors were consumed one after another until the harbour looked fit to bursting, as indeed it was. This of course left very little space for any birds, the majority having been pushed over to Pembrey Burrows and out of sight. There were still gems to be found however which included at least thirteen Mediterranean Gulls loafing out in the Burry but I’d estimate that you could safely triple that number with ease and still not be near their true population. An impressive increase when I think back to even a couple of years ago. Their stable-mates the Sandwich Terns were much noisier with special mention going to one particular pair which spent a good ten minutes flying in high circles overhead, each clearly not happy at the others presence. 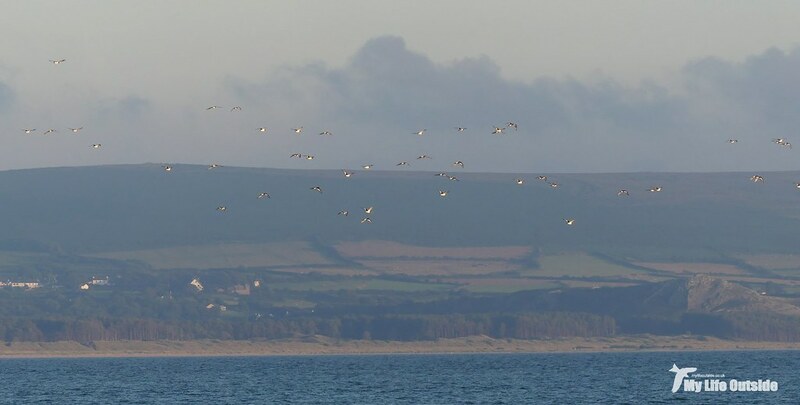 Equally vocal were a couple of hundred Oystercatchers huddled together on the eastern point of Pembrey Burrows, their evening roost slightly disturbed by a couple of kayakers wisely biding their time until the waters had ceased their race. Eventually even that position became untenable, consumed entirely and sending the flock skywards. Indecisive they milled around in front of us for a few moments before eventually heading over to Gower. We may not have Eagles down here but we do a fine line in Oyks. Four Dunlin were also present briefly along with a small number of Common Gulls but there was no sign of the hoped for Ringed Plovers roosting on the inner breakwater. Probably too much disturbance. 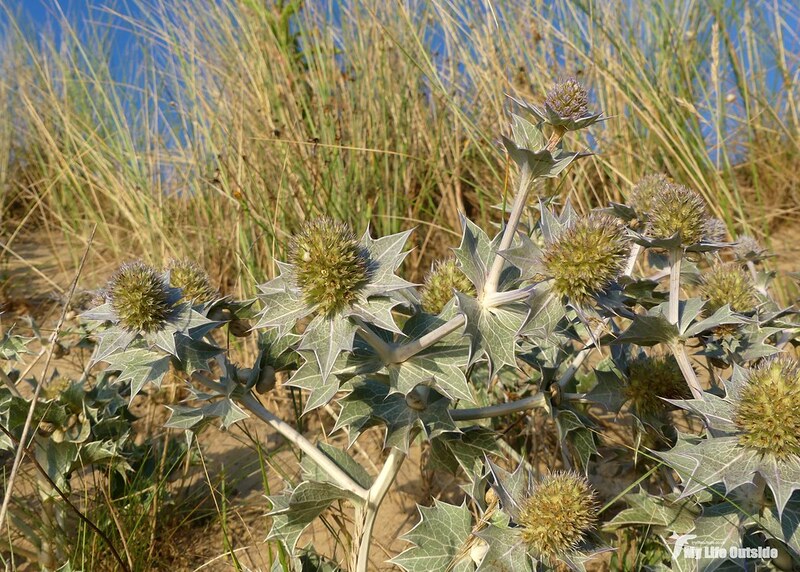 Not a problem for the colony of Sea Holly which also grows there and which was looking in fine health on this balmy summer’s eve. We finished off with a juvenile Linnet which briefly had us shouting Twite before our location brought us to our senses. It may take a few days to get my birding radar back into Welsh mode.